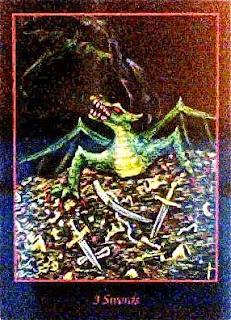 Today's Draw: Three of Swords from Twilight Realm, A Tarot of Faery. Are you holding on too tightly to something right now? Do you think holding on tightly is helping the situation? How might you better manage the situation to your advantage? The Three of Swords is about quarreling and heartbreak and separation. It's one of those cards you don't want to see come up in a reading. Usually you see three swords puncturing a heart. But here we see a dragon so ferociously and selfishly guarding it's possessions that it drives its dragon partner away. At one time or another, I think most of us have been guilty of holding on to someone or some idea so tightly that we end up pushing others away. Maybe we're afraid of losing our mate, so we become overly vigilant. We limit their freedom. We hold on too tightly....even become irrational. Which makes our mate want to flee. Or we treat a child that way. Or maybe we're afraid of losing money, so we become miserly and make everything about money. Whenever we hold on too tightly, we close ourselves off to others and to opportunity. Worse, we create the very thing we're afraid of happening. I know many years back I did that with a boyfriend. I was so afraid of losing him that I behaved in a manner that pushed him away. Now, in this particular case, it was a blessing...haha...but too often we hold on tightly to things that aren't even ours. Another person does not "belong" to you, regardless of how long you've been married. A child doesn't "belong" to you just because you're its parent. And money needs to circulate. The more you hold on to it, the less new money will come into your grasp, primarily because you're focused on keeping, rather than making. I once heard a metaphor that I found very helpful. Whatever it is that you want to hold on to, pretend it's a wet bar of soap. Hold too tightly and it will pop out of your hands. Hold too loosely and it will slip off your hand. But hold with just the right pressure and the soap is stable. Then, of course, there's the whole "if you love something set it free" thing. Fear of loss is something we all have from time to time. And it is never attractive to others. And it never feels good to you. It feels manic and desperate. We all recognize when we're doing it. And the best thing to do at that time is to step back, take a breath and remember that there are some things you just can't control. Like other people and the decisions they make. And that God always brings us what we need in the moment. That may include losing something you want to hold on to. But God only empties your hands in order to fill it with other joys. The ironic thing about fear of loss is that it blocks us from ever having anything better. And if you think the thing you're holding on to so tightly is "better", think again. Because the dynamic is flawed if your knuckles are white from holding on. In that situation, the fear of loss owns you. And you can't be happy when the fear of loss owns you. You can only truly be happy when you're free of fear...and that includes fear of what is to come. Let the universe do it's work. If something is slipping through your fingers, it's probably because the universe has a really cool miracle planned for you. Turn away from the fear and turn toward trust...in God, in life and in yourself.